A chance meeting with a Josephite Sister in 2004 led bronze sculptor Linda Klarfeld on a journey that would result in her creating a monument of St Mary MacKillop and a strong connection with Australia’s first saint. “This place is not easy to find, and it was one winter’s day and a lady came in,” says Prague-born Linda of her Terrey Hills studio. Linda Klarfeld in her Terrey Hills studio. Born in Czechoslovakia, Linda moved to Australia at the age of four with her family. “I didn’t actually know who Mary MacKillop was,” she says. Several months later Linda was visiting an isolated Aboriginal community in Western Australia. “There was nothing anywhere, it was remote desert, so hot, and there was nothing there but a church which was inspired by Mary MacKillop,” she recalls. When the ACU asked Linda to include Blessed Mary’s dog in the monument for the North Sydney campus, she was stunned because “Mary MacKillop had an Australian terrier and so do I”. Linda has been sculpting since she was seven years old, when she made a self-portrait. At the age of 14 the film Camille Claudel about Auguste Rodin, the French sculptor responsible for The Thinker, convinced her that sculpting was what she wanted to do. But there were few opportunities to enter the industry. “Neither of my parents are in any creative field or anything and there are very few sculptors around here,” Linda says. “So I had to search out an education, which was difficult. First I went to art school and then someone said, ‘You shouldn’t be here, you should be with this person’, so I went to that person to be an assistant and they said, ‘Oh no, I can’t teach you that, you have to go to Europe’, so I went to Europe. Although her parents wanted Linda to do whatever made her happy, her grandfather was “totally against it”. At the age of 21, Linda was asked to sculpt the Stations of the Cross, her first major commission. She recalls: “It was over 100 figures in relief. Cardinal Clancy unveiled that and it was one of the biggest commissions a 21-year-old has ever received. “It was interesting because it was religious and I had no idea, so I had to study the Bible to find out what does this mean, and I had advisers to educate me. “That was my first taste. Now I have a more emotional connection because of Mary MacKillop. “She was this lone, determined woman who in a way was a career-minded person, and at the time it must have been crazy. “She had a lot of opposition and when I started sculpting it was a male-dominated field, so to be this young female sculptor who makes public monuments double my size, people wouldn’t do what I wanted. Through the sculpture, Linda has witnessed the devotion to St Mary MacKillop. “People actually love her, they really do, and you can see it when they come to the statue. You can see that relationship. “At first I didn’t know how it would relate to me, and now I feel like I have this personal connection, almost like being a chosen one. Linda believes that the work she does is sent to her for a reason. She is also commissioned to do paintings and other works, but prefers bronze for longevity. “The reason that I’m a bronze sculptor is I realised at 14 that people can actually die,” she says. “I thought, well, I don’t like that, I think people should live forever. So what can I do about it? Bronze; it lasts forever. If you make a statue it will be there for 2000 years. 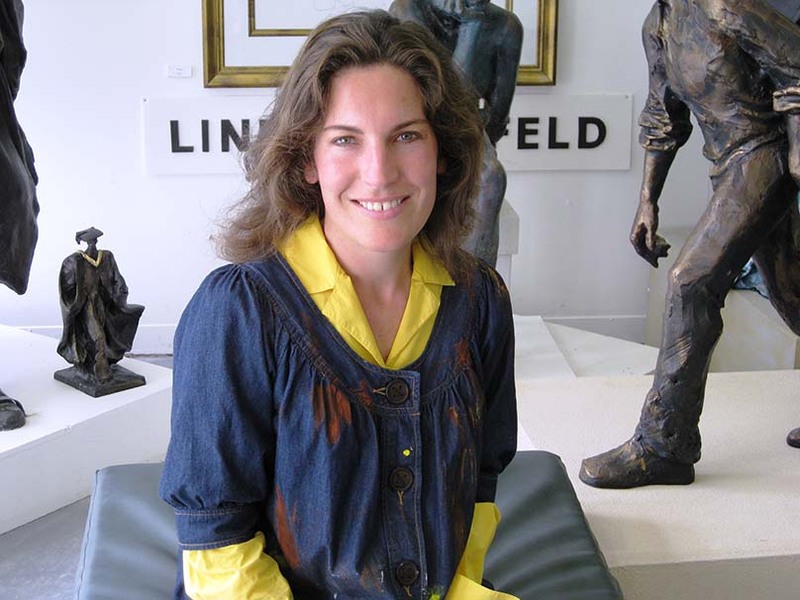 Linda says sculpting is a lengthy, time-consuming process, with one series of 16 life-size statues now nearing completion after seven years of work. “It’s the thing about time; sculpting is a very slow thing to do, and the process hasn’t changed for thousands of years. With a studio full of copies of her favourite pieces of work, “as you see, I don’t really let them go”. “If I can I keep a copy, a resin master, the client has the bronze and I have the resin master in case something happens. Well, I justify that way! “Sculptures don’t photograph well because a sculpture is in your personal space; it’s almost like that person is there. “Mary MacKillop is almost there, sitting there looking over her garden, and you can touch her and you can pat her dog. With a painting, you can’t, and a photograph doesn’t have the same effect. Having sculpted the Stations of the Cross, Mary MacKillop, other prominent Australians and her Board of Directors series, there is one project Linda would like to try her hand at. “There are relief sculptures that haven’t been finished on the Art Gallery of NSW. There are three or four big relief sculptures, and it’s unfinished for some bizarre reason. With Mary MacKillop now enshrined at ACU, Linda says she will still visit her from time to time, as well as return to Mary’s tomb at North Sydney. And she still carries the relic of Mary MacKillop when she needs to. Next articleWhen did we start celebrating All Saints Day?